NOTE: This radio news story is about a fake Hong Kong university selling diplomas online. Story got picked up by many news agencies and prompted the founder of Alibaba, Jack Ma, to respond as diplomas were sold on his online platform in mainland China. The story, in Cantonese, was on a radio news program of Radio Television Hong Kong (RTHK), the public broadcaster in Hong Kong. A fake university called “Suwen University of Hong Kong” is touting diplomas on an online shopping platform in mainland China. 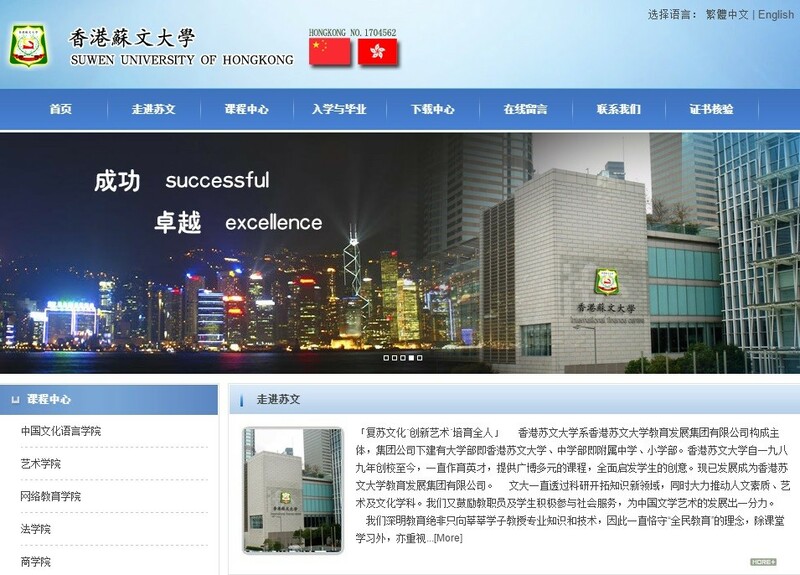 The seller claimed that the “university” is legally registered with the Hong Kong government. We tried to contact the “university” through the address and telephone number given on its website, only to reach firms that provide company registration services. A spokesperson for the Education Bureau said Suwen is not a registered school. On the largest online shopping platform in mainland China, Taobao, an institution called “Suwen University of Hong Kong” is selling diplomas of associate, bachelor’s or master’s degree program for RMB 300 to RMB 1,000. After making the payments, Suwen said, no class is required, and the diplomas will arrive by mail in 7 to 10 days. 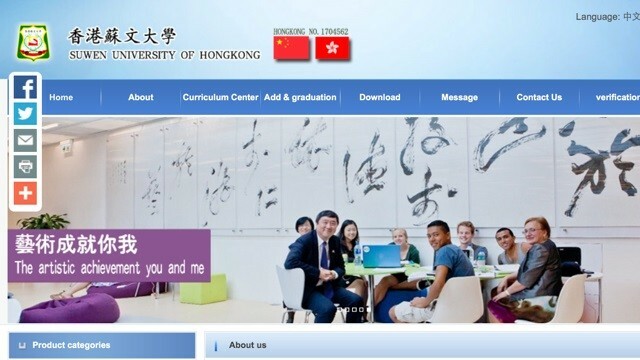 The “university” claimed itself as an officially registered institution in Hong Kong. Instead of showing the photo of its president, if any, on its website, Suwen University posted a photo of another university’s president on the front page, who is Joseph Sung, the president of Chinese University of Hong Kong. Other photos in the “About” section on the site showed pictures of the landmarks in Hong Kong, including International Finance Center and Harbor City — with the logo and name of Suwen University photoshopped onto the facades of those buildings. Another photoshopped picture showed a banner of a school activity with Suwen’s logo centered and top, however, the small english words at the bottom of the banner told a different story: This activity was organized by the Hong Kong Institute of Education, instead of Suwen University. A phone call to the “university” via the numbers given on its website led to a firm providing company registration services. “Suwen is not with us anymore. We have no idea,” the operator said in Mandarin. On its website, what appeared to be the address of Suwen’s campus also turned out to be the office of another firm that provides registration services in Hong Kong. A spokesperson for the Education Bureau in Hong Kong said Suwen is not a registered school. Lieyang Qian, a criminal attorney in mainland China, said selling diplomas through a fake university could be considered a crime. “If anyone reaped financial gain from doing this, this could be a breach of criminal law of the People’s Republic of China,” Qian said. When confronted by the reporter, the sellers later admitted that Suwen University is not a registered school and only has business registration in Hong Kong. Asked if using the word “university” was misleading, the seller insisted that the name of the company on business registry also has the word “university.” He saw nothing wrong with it.